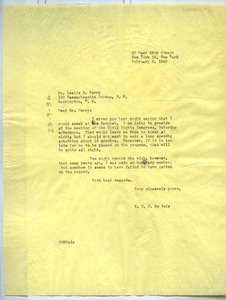 New York (N.Y.) - Addressed to Leslie S. Perry; offering to take him up on his recent invitation (mums312-b125-i073) to address the Club, though warning, "I should not want to make a long speech; something about 15 minutes." 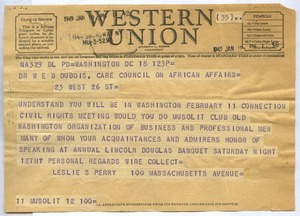 Washington (D.C.) - Sent by Leslie S. Perry; inviting him to speak at the Club's annual Lincoln Douglas banquet on February 12 in Washington. 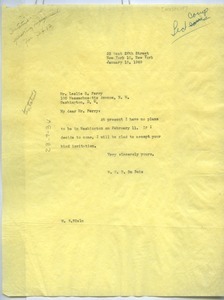 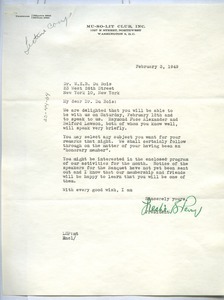 Washington (D.C.) - Signed Leslie S. Perry, President; confirming his February 12 engagement at the Club's annual banquet; noting he may "select any subject you want for your remarks"; and enclosing a copy of the organization's monthly program.